Celeste Cooper, that’s me, is now a Health Pro at Health Central. 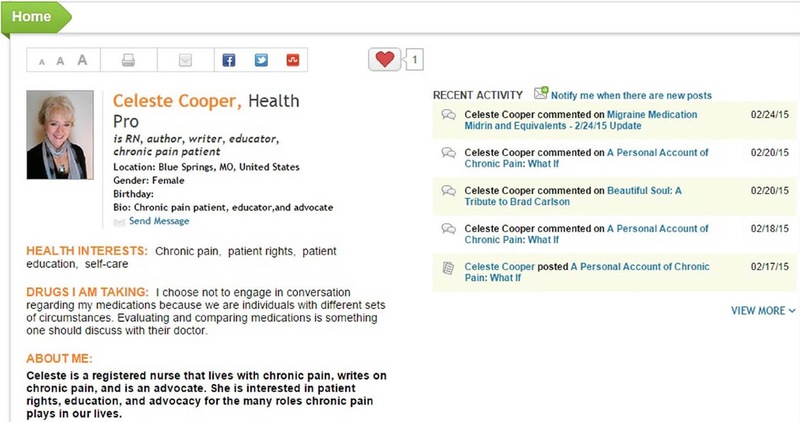 My role there is to write twice a month on issues having to do with chronic pain. This includes writing about various conditions, coping strategies, and items of interest to you as a community member. As you can see from my very first post, A Personal Account on Chronic Pain: What If, it is YOU who inspires ME. If you have a question, all you have to do is ask. Each of us at Health Central comes to the table with our own life’s experiences and that includes you! Follow my posts here where will see “Recent Activity” to the right. Here you can stay up to date with my posts and have them delivered directly to you as they are posted. You might find other topics that apply to you, and you can follow those experts the same way. Use key words in the search bar to find posts, questions, and answers. Ask Questions. Once you become a member, you can ask questions here. I hope to see you at Health Central.